The Laney College Student Services mission is to provide quality support services with an appreciation for diversity by empowering students to achieve their academic, career, and personal goals. Below is information on the different student services resources available to students at Laney. Laney Adult Transitions Program serves adults (18+), who are interested in enrolling at Laney campus to further their education and increase their employability. Laney is a safe space that welcomes diversity of all kinds and fosters respect and indiscriminate engagement amongst staff and students. 1. Orientation to the college. 2. Basic skills assessment in language usage, reading, and mathematics to assist students in selecting courses appropriate to their current skill levels and/or for use in consultation with counselors. 3. ESL (English as a Second Language) assessment tests. The Laney College intercollegiate athletic program provides students the opportunity to participate in men’s football, baseball, and women’s basketball, swimming, track and field, volleyball and water polo. Laney College is a member of the Bay Valley Conference (BVC) and the California Community Colleges Athletic Association (CCCAA). The Laney College Bookstore carries all course materials required for courses at the College, as well as school supplies, imprinted clothing and gift items, course-related reference materials, beverages, and snacks. The bookstore will buy-back used textbooks from students during business hours. If the book has been reordered for the upcoming semester, students will be paid up to 50 percent of the purchase price. The best time to sell books is toward the end of the semester after the instructors have placed their orders. Textbooks will be stocked in the Laney College Bookstore during the first four weeks of each semester. Unsold textbooks are returned to the publishers beginning the fifth week of classes. It is recommended that students purchase their textbooks as early as possible. • The customer’s satisfaction is our #1 priority! • The bookstore gladly accepts returns of merchandise. provided the merchandise is in resalable condition. Original cash register receipt is required. calendar days from the first scheduled day of classes or within TWO business days of purchase thereafter until the last THREE weeks of class. Books must be in the original condition with all packaging intact. • If you have dropped the class (proof may be required), a full refund is available with your receipt through the end of the add/drop period. Books must be in the original condition with all packaging intact. • Textbooks purchased for summer term, short term, late term or weekend classes are refundable within TWO business days from the first scheduled day of classes or within TWO business days of purchase thereafter. Books must be in the original condition with all packaging intact. NOT refundable, but may be SOLD back under our book buy back policy. • If you have purchased your textbooks through EOPS and CARE, returns made will be credited back to the program. Original purchase receipts is required for any returns or exchanges. • Please be careful before opening shrink-wrapped sets. Many contain electronic media and if opened, are only returnable if they are defective. • Course readers and syllabi are NON- REFUNDABLE. Cooperative Agencies Resources for Education (CARE) is an educational program which represents a cooperative effort between the community college, Department of Social Services, and the Employment Development Department to help single parents achieve educational goals. CARE offers the following services: counseling, orientation, personal development classes, support groups, peer advising, workshops, financial, and childcare assistance. East 10th St. & 2nd Ave.
Laney College provides free, limited child-care services for pre-school children of qualified full-time students. 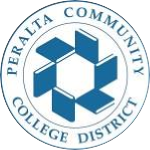 The Children’s Center is administered by the Peralta Community College District. Students who wish to enroll their children in the campus Children’s Center should apply directly at the Center. Laney College provides its students with the opportunity to enroll concurrently in one class per semester/quarter at the University of California, Berkeley; California State University, East Bay; Mills College; Holy Names University; or John F. Kennedy University. For more information about program eligibility criteria and participation in the program, make an appointment to see a counselor at the Counseling Department Office, call (510) 464-3152. 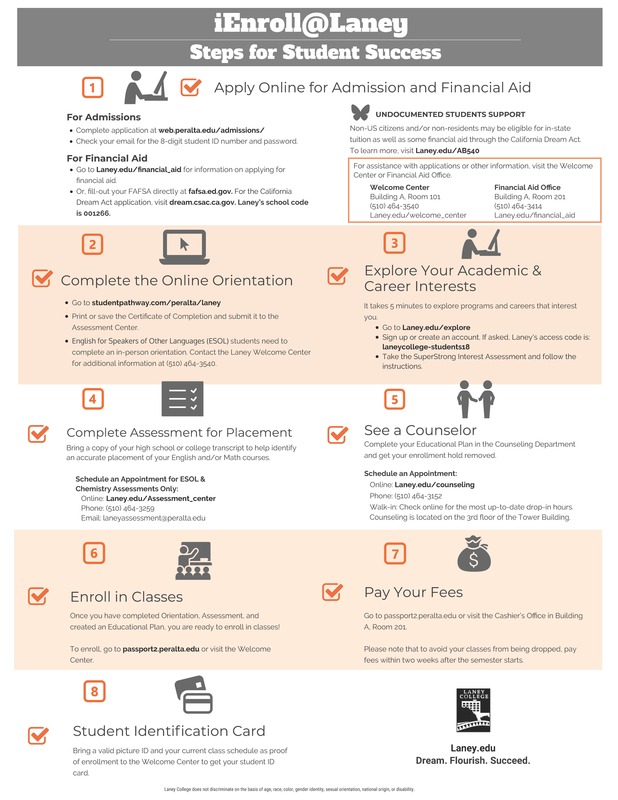 The College requires all new students to participate in the Student Success Matriculation Program. Students must develop their first year “Educational Plan” with a counselor. Counselors are available by appointment at (510) 464-3152. For brief questions or emergency problems, counseling services are available on a drop-in basis. Discussions of personal matters are confidential. 1. The Disability Resource Center: offers services according to individual needs and availability of resources. Services include, advocacy, disability related counseling, vocational and educational planning, and individually prescribed support services, such as test accommodations, mobility orientation, readers and referrals for special instruction. 2. Hearing Impaired Services provides interpreting, registration, and other support services for hearing impaired students. 3. Alternative Media Center provides books and other materials in other formats such as Braille, e-text, and large print. helps students find work in their chosen field. a. The Learning Skills Program – for students with learning disabilities, offering specialized tutoring and test accommodations for Laney classes. b. The High Tech Center – Adapted computer technology training and computer aided instruction for students with disabilities as referred by a DSPS Counselor, using state-of-the art hardware and software. Laboratory time is available for trained students to use the computers for class assignments. For these programs or services, appointments must be made with a DSPS Counselor in the Disability Resource Center. This document lists information on housing for the homeless, food banks, domestic violence, and other information. 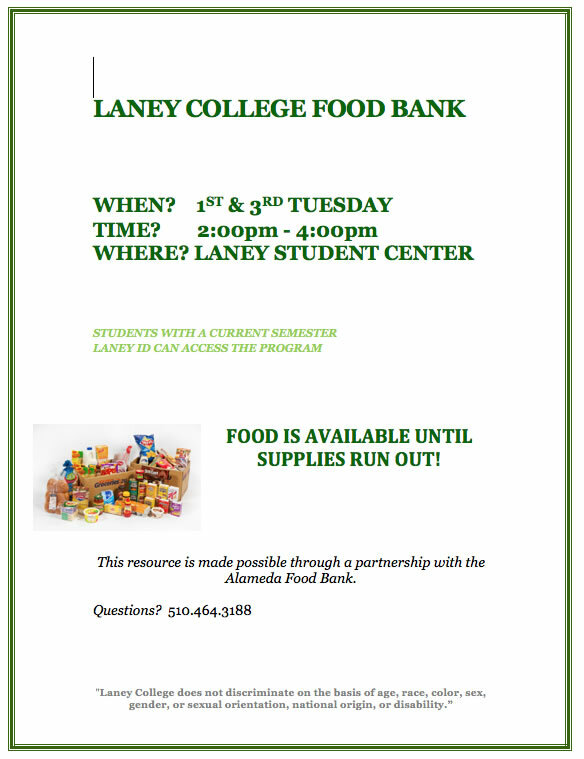 For Fall 2017 Laney Food Bank information, click here. The Employment Services Center assists students with a number of services, including resume building, interview workshops, and employment information. The center also holds numerous job fairs each semester to connect students with potential employers. 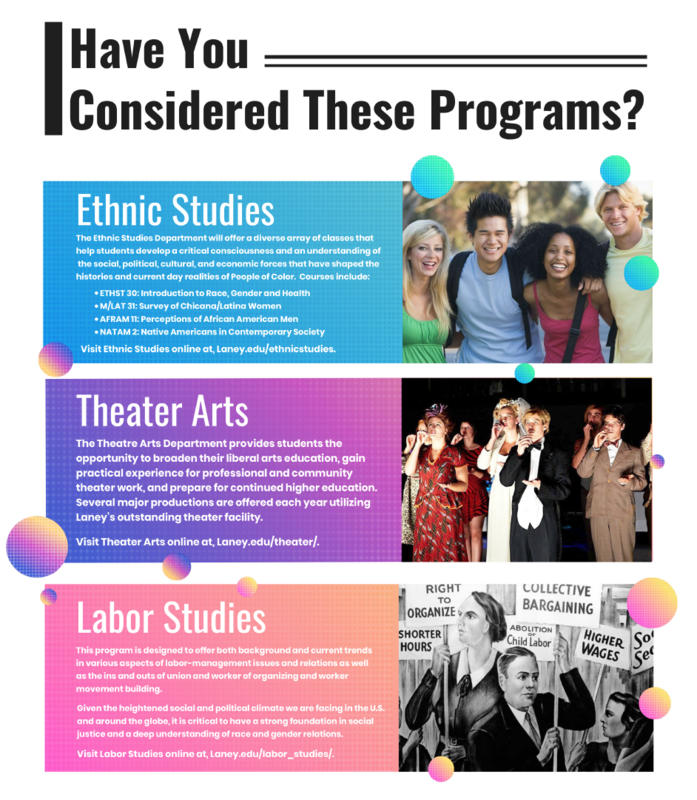 The Extended Opportunity Programs and Services (EOPS) provide educational opportunity for non-traditional students who are educationally and economically disadvantaged. Support services include, registration assistance, orientation, counseling, peer advising, tutoring, transfer assistance, tuition fee waiver for CSU and UC transfers, book vouchers, and financial assistance for eligible full-time students. The Office of International Affairs and Distance Education provides quality support services to enhance student learning for international students in the following areas: admissions, immigration issues, academic/personal counseling and advising, orientation for new students, tuitions issues, housing, activities, trips, health, medical, and safety issues, tax workshops, assistances with Social Security and Department of Motor Vehicle matters, as well as online support services. All international students must first apply through the Office of International Affairs and Distance Education by completing and submitting the International Student Application Form, along with the $50 application fee, before enrolling at the colleges. The application may be downloaded at http://international.eperalta.org/. Additionally, all new international students are required to attend a mandatory orientation held at the start of each semester. Students will receive information regarding academic matters, immigration issues, heath/safety issues, and much more. For detailed information on learning communities, click here. The Library and Learning Resources Center (Building L) houses a wide variety of services and resources for students, faculty and staff. The Library, on the main floor, contains more than 30,000 volumes, 215 periodicals, pamphlets and microform materials. Also available are photocopiers and computers for library research, study rooms and a leisure reading area. The Laney Tower is produced by students in Laney’s Journalism Department. The Tower, first published in 1952, has won many awards over the years and has trained many professional journalists. To join the newspaper staff, students should contact the Journalism Department. Phi Theta Kappa, an international community college honor society, promotes scholarship, service, and community leadership. Laney’s chapter, Alpha Chi Theta was founded in May 1992. Chapter members participate in numerous campus and community projects. Membership is open to all students who have accumulated 12 semester units with a GPA of 3.50 or higher. The Laney Safety Aides are members of a team of diverse student leaders in good academic standing who have demonstrated excellent leadership abilities. Safety Aides reinforce safety policies here on campus. While working closely with staff, faculty, and law enforcement, the Safety Aides help the Laney campus continue to maintain a safe learning environment. Safety Aides assist with patrolling the campus, providing escorts to BART and the parking lots surrounding our campus. Through their hard work, safety aides develop important skills including, leadership, communication skills, safety policies and procedures, and they are CPR compliant by completing a 40-hour training session prior to being hired. The College maintains a limited listing of scholarships and awards sponsored by various alumni, professional groups, and other friends of the College. Most scholarships are special merit awards used to give recognition to individuals who have distinguished themselves in areas of academic performance and co-curricular activities and who demonstrate financial need. Scholarship announcements are posted around the campus and on the Laney Scholarship webpage. Information is available at the Office of the Vice President of Student Services. Student activities are recognized as an integral part of the college curriculum. 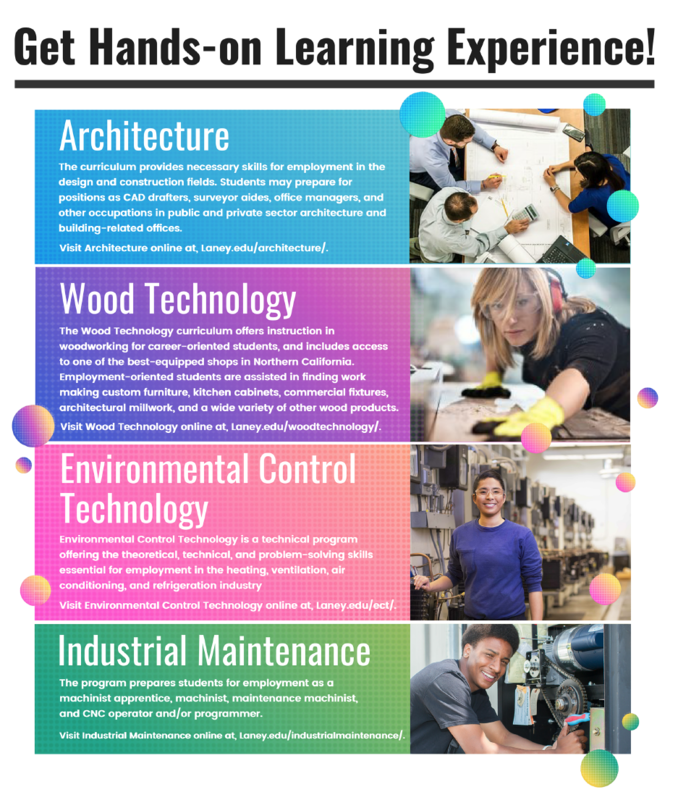 These activities provide students with opportunities to apply concepts learned in class while continuing to build skills for careers, transfer, and community involvement. Students interested in forming new clubs, running for student body office, or other student activities should contact the Student Activities Advisor. Student Ambassadors are members of a team of diverse student leaders in good academic standing who have demonstrated leadership abilities. Working closely with staff and faculty, student ambassadors represent the college both on and off campus, attending educational events, conducting tours and assisting new and returning students with the enrollment and orientation process. Through their work, Ambassadors develop important skills, including leadership, communication skills and event coordination. Ambassadors work as a team and are an important part of the Office of Student Services at Laney College. Officers elected by the student body comprise the Student Council and Senators who serve as the governing body for student affairs. Council meetings are open to all interested students. The Council and its committees provide an opportunity for students to assume leadership roles and actively participate in student activities. The Associated Students of Laney College charters all student organizations. These organizations must submit a constitution approved by the ASLC. The clubs are governed by the Interclub Council. Any group of students having a common interest may petition the Student Council for recognition as a chartered club. The club must have a faculty sponsor and adhere to the general rules and regulations established by the Student Council and the College administration. All activities and events sponsored by student groups must be supervised by members of the faculty or staff. The Associated Students of Laney College charters all student organizations. These organizations must submit a constitution approved by the ASLC. The clubs are governed by the Interclub Council. Any group of students having a common interest may petition the Student Council for recognition as a chartered club. The club must have a faculty sponsor and adhere to the general rules and regulations established by the Student Council and the College administration. All activities and events sponsored by student groups must be supervised by members of the faculty or staff. A club or organization chartered by the Student Council must abide by policies set forth by the College. These policies require open membership and prohibit hazing or secret initiations. • Supportive Resources & Services: Library of college handbooks and reference handbooks, four-year college representative visits, transfer workshops and information sessions, computers for research and applications, field trips to four-year colleges, online calendar of transfer activities, and an annual Transfer Day fair. • Transfer Admission Guarantee (TAG) is a program that offers students guaranteed admissions to participating colleges and universities. Several University of California campuses offer guaranteed admissions to students who meet specific requirements. 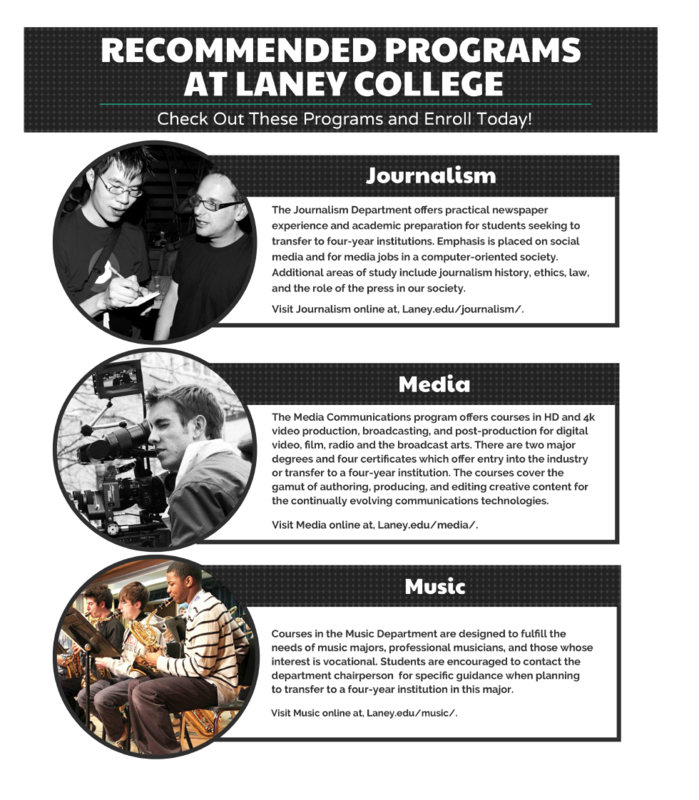 The Laney College Tutor Program provides instructional support across the college curriculum. Current operations include the Math Lab, James Oliver Community Writing Center, and the Tutoring Resource Center. The Math Lab offers drop-in tutoring in mathematical concepts, a productive study environment, access to instructors, and paid work experience for student tutors. The Writing Center provides drop-in tutoring in reading and writing across the curriculum, Writing Workshop courses in ESL and English, access to computers for use in completion of writing assignments, and paid work experience for student tutors. Students interested in working as tutors in the Tutor Program should enroll in LRNRE 30 Introduction to Tutoring and contact the tutoring coordinator. Tutoring in other subjects is offered through specific departments in designated areas. Check with your instructors for current availability. Laney College is approved by the Council for Private Postsecondary and Vocational Education, and Veterans Administration as a degree granting institution for veterans and eligible dependents seeking educational or vocational training under Title 38, United States Code. Procedures for applying and certifying veterans’ benefits are provided by the Veterans Affairs Office in the Student Center. To receive benefits all veterans are required to consult with a counselor for development of an Educational Plan as mandated by the Veterans Administration. Non-degree college credit is given for completed courses numbered 250 and higher. Veterans requesting credit for military experience or courses taken during military service may receive six elective units toward their associate degree. All veterans not enrolled in the veterans program and who have completed 12 semester units may obtain military credit by providing a copy of their discharge papers (DD-214) to the Admissions and Records Office on campus. A veteran student who is on Academic Probation for two (2) consecutive semesters shall be subject to discontinuance of benefits if the student earned a grade-point average of less than 2.0 (“C“ grade). This directive is separate and apart from Laney College’s Standards for Academic Dismissal. 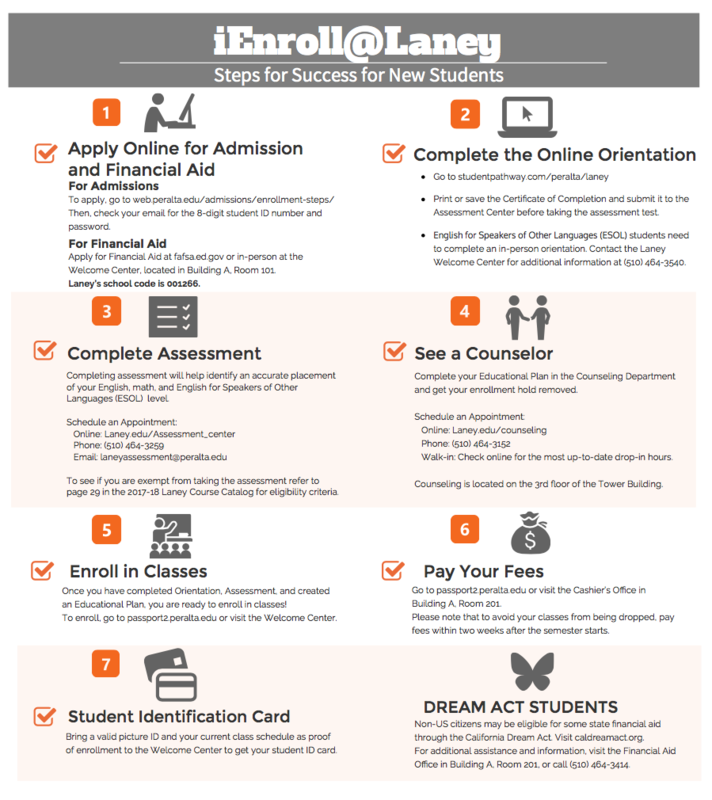 Open for students to receive assistance with online admissions, registration, financial aid application (FAFSA) processes, photo ID services, and class schedule print outs are also available. Laney provides on-campus services of a nurse and mental health counselor to support student health and wellness. Consultation and health services are free of charge to all Laney College students. Please note: Labwork, pharmacy, and x-ray services are NOT provided at the Peralta Wellness Center. If you have no insurance coverage, you will be charged for these services. CalWORKs funds are for the purpose of assisting welfare recipient students and those in transition off of welfare to achieve long-term self-sufficiency through coordinated student services offered at community colleges including: work study, job placement, child care, coordination, curriculum development and redesign, and under certain conditions post-employment skills training, and instructional services.